Do you cut your family's hair? For at least the last 10 years, I have been the family barber. I have always cut my husband's fine, soft hair as well as Elder Boy's thick, curly tresses. Both of them hated the way the barber cut their hair. Why they chose me to do it instead, I'll never understand. 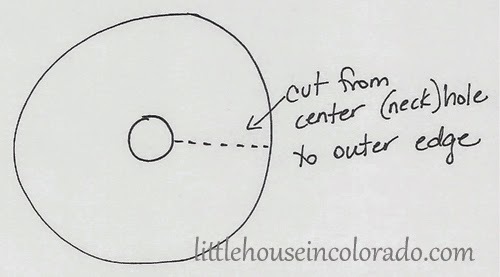 But after spending a LONG time trying to get The Girl's long locks evenly trimmed (and still failing) and totally chopping up The Boy's extra thick, straight hair once when he was little, they both started going elsewhere to get their hair cut. The inspiration came from Choo Cha Handmade though the site doesn't appear to be available any longer. Still, even with the few directions given for this cape I had some changes I wanted to make (and I wanted one that would be big enough for adults and children). I thought about an adjustable collar to keep cut hair from going down the back of the neck. I also wanted the fabric to overlap in the back - again to keep hair from finding its way under the cape. Note: The resulting hair cutting cape is probably much larger than I need since it is cut into a full circle. You could make this with a LOT less fabric by making it from a semi-circle of fabric...but I'm just not going back and starting over...not until this one wears out and I need a new one. I originally planned to make one of oilcloth, but changed my mind when I remembered how much I disliked the stiffness of oilcloth. Then I thought of making one with nylon (as the tutorial suggests) but knew I'd have to go out an buy the fabric. I figured I'd just make it from something in my current fabric stash and then shake it out and wash it after every use. I didn't have a bias tape maker so this took a LONG time. Eventually, I wound up with about 10 yards of double-fold bias tape. Thankfully, it was just enough to trim everything, cover the one seam inside the collar and make the ties. I have no photos of the process so please forgive my rough illustrations. 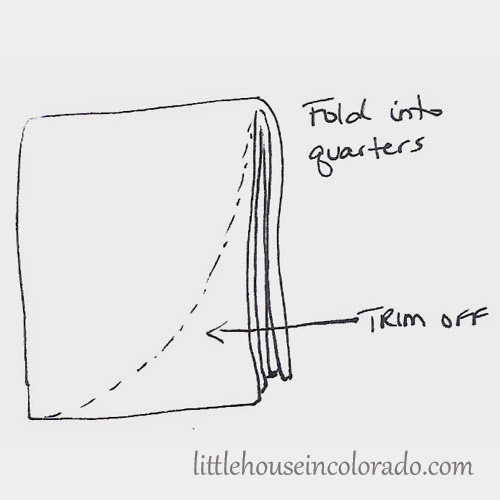 I cut the cream fabric into a large square (about 2 yards by 2 yards) then folded it into quarters. I trimmed the bottom of the fabric to curve it into more of a circular shape (keeping the fabric folded). Then at the other end of the fabric, I found the center point and used a compass and pencil to draw out the center hole (for the neck) and trimmed it off. I cut out the hole and then cut a straight line from the edge of the center hole to the outside edge of the fabric. 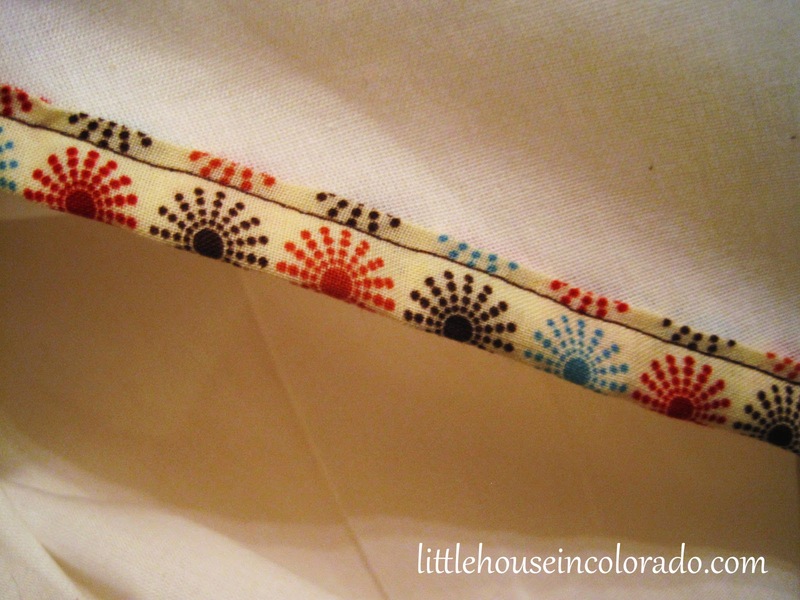 The collar, made from a 2-1/2" width of fabric folded over has a 1" wide strip of lightweight interfacing sandwiched between the layers. It's sewn into the neck - one edge even with the side fabric and the other end extending beyond. Don't mind that upside-down "V" on the left. 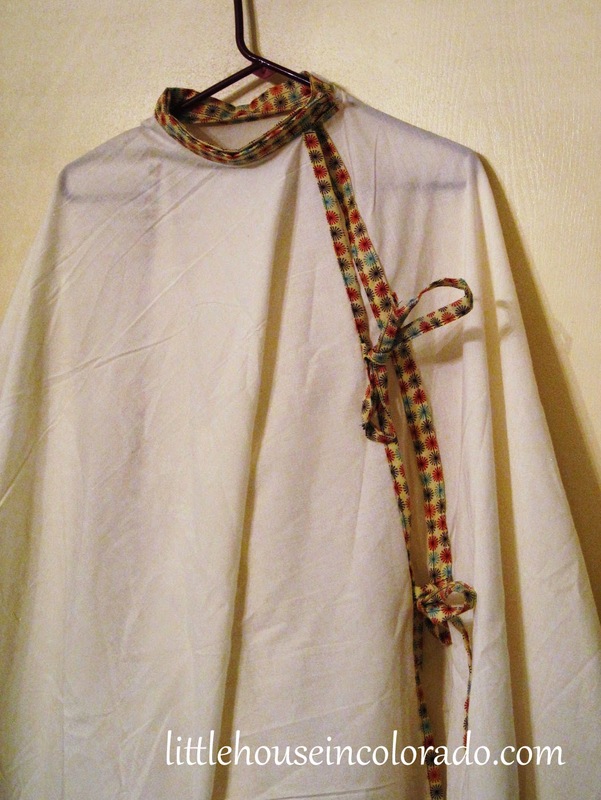 I was trying to illustrate that the cape would not lay flat while you pin the collar on. Unfortunately, it just raises questions as to what the heck it's supposed to be. I only had two sets of Velcro circles on hand (a Velcro strip would be better) so I tried the cape on Mr. LH then on The Boy to mark an approximate locations for the Velcro on the collar. 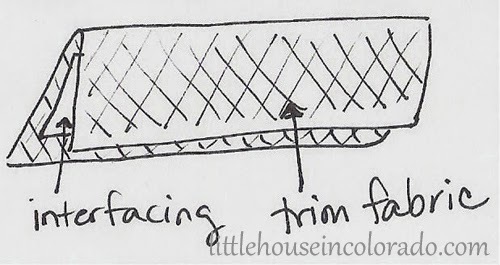 Because of the overlap for the ties, I marked their designated location on the fabric with a pencil at the same time I measured for the collar. 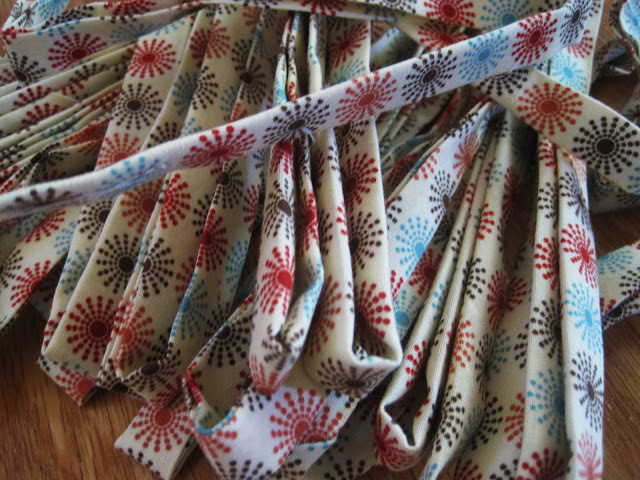 A final strip of trim fabric was sewn onto the cream fabric with the ties secured inside. 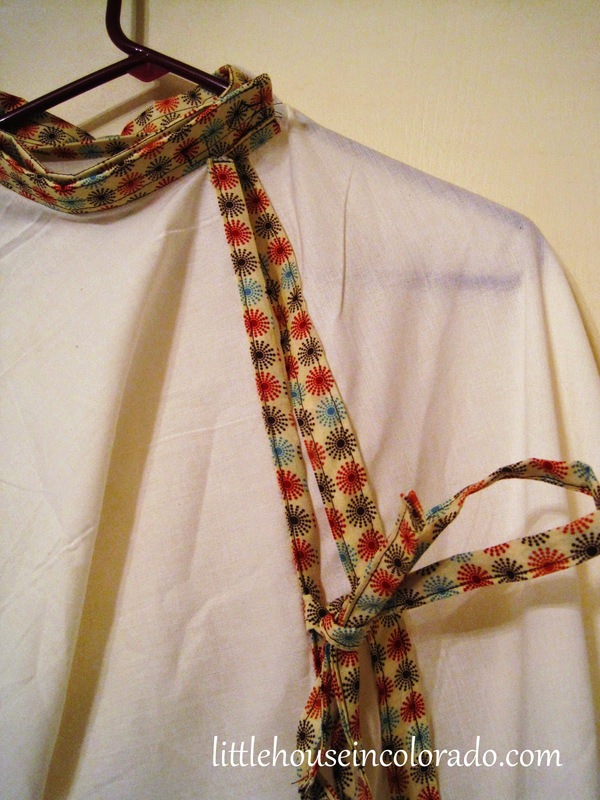 The corresponding ties were sewn in with the edging. Since we started our new budget last month, and because The Boy is considered an "adult" at the barber now (and pays adult fees for a haircut), I decided to try my hand again at cutting his hair. 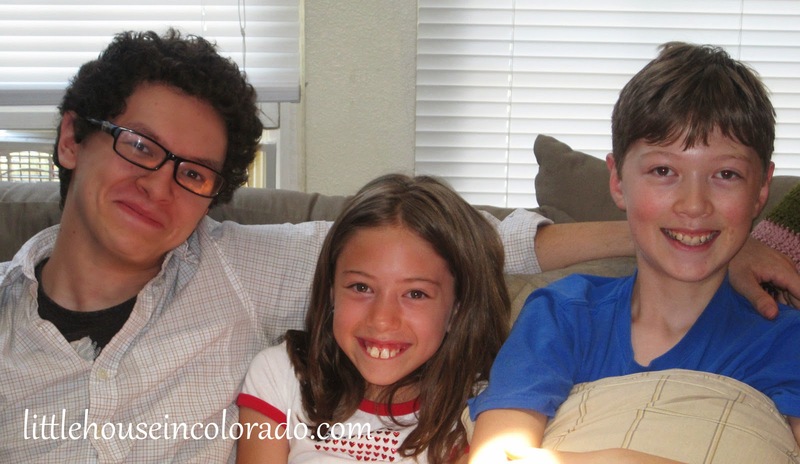 Elder Boy (far left) needs a haircut, but he didn't stay long enough during this Father's Day visit to get one. The Boy (far right) sports his new "do" but of course didn't brush his hair this morning. The Boy is not as patient with me as he is with the ladies at Great Clips but we saved some money and he seemed fine with his hair cut. 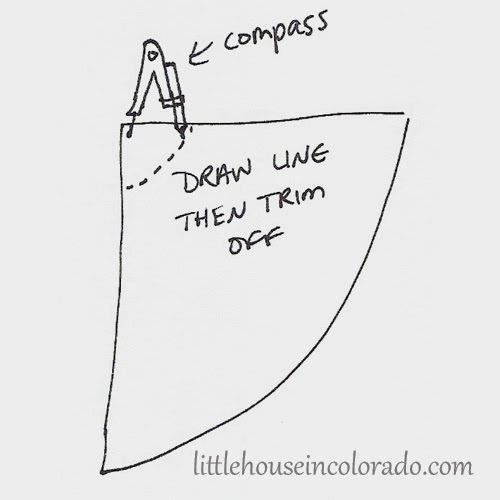 Hi I am a cosmetologist and my advice is if you choose do haircuts on your own remember that cutting hair is about angles. 45's 90's 180 which either is perpendicular to the floor or parallel to the floor. Another alterative is to find a cosmetology school they usually charge have the amount that you pay in a salon and if you are leary ask for the senior that is almost ready to graduate. I can give you more details on haircuts but you can also find great youtube videos.